Blog names. Sometimes I wish I could change mine. I started out as ‘miraclemama’ then realized I needed something less ‘mama-ish’. Now every time I see my blog title, I think of the movie Flashdance. Completely Obstructed View: Jeez! Could You Please Sit Down So I Can See the TV? You Make a Better Door than a Window, Buddy! Every day, I pick my son up from school and on the drive home, I ask him, “How was school?” and he always answers with, “Good” and lots of crushing silence. My 5 year old daughter and I watched as a 4 year old in her preschool class had a major meltdown in front of the school. The girl kicked and screamed and fell to the ground crying as her mother struggled to calm her. My daughter’s eyes got real wide as she said, “Wow! Did you see that, Mom? Now that’s just rude!” She refused to believe me when I informed her that, once upon a time, she used to do the same thing. About a week ago. And I leave you with a question I pondered this week. Q: How do you know you’re getting old? A: When you quickly turn your head to tell your son to stop jumping on the couch and you suddenly realize you can’t turn your neck in either direction for days afterward without debilitating pain. A: When you go sledding down a little hill and pray every second of the way you don’t end up in traction. A: When you take a sip of wine over the holidays and realize that was one sip too many. A: When 7 pm rolls around and you can’t keep your eyes open so you start to get ready for bed and the first thing you do is look for your slippers only to realize you’re already wearing them. And your flannel pajamas. And your bathrobe. And you’re sitting in a rocking chair. Doing a crossword puzzle. Wearing glasses. And watching Wheel of Fortune. Cursing and yelling out the phrases to your cat, Mr. Jingles. More power in your blogging! Thanks, silverlining. More power is good. I like “She’s a Maineiac”. I think its perfect! And I’ll admit to feeling the “old” too. Thanks, BRC. It took awhile to grow on me, but I’m stuck with it now. And I have to admit to feeling old now because it’s pretty obvious to everyone else around me that I have succumbed when I wear slippers all day long. Ha! Darla you are simply awesome! Thank god i have n’t stolen any of your blog names! 🙂 But i am considering about one of your blog name “Warm Fuzzies and Cold Beer” to copy. What say? 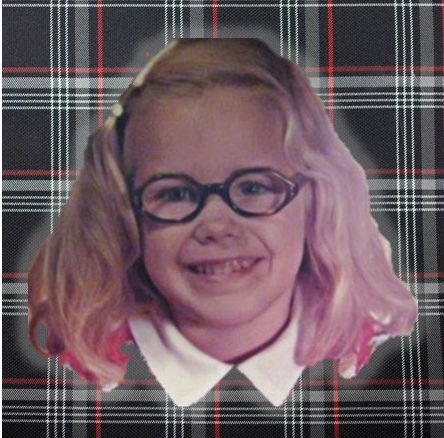 Thanks Darla for all the laughs! Keep writing, keep smiling and always help us smiling just the way you always does. Ha, well, you are more than welcome to Warm Fuzzies and Cold Beer, Arindam. Although, if my husband ever gets his own blog up, he’ll probably want to steal that one too. I’m with Brown Road Chronicles. “She’s a Maineiac” is possibly one of the best names evah! And I think that you start being old when you try to figure out all the things that “don’t count” towards being old. Elyse, it’s too bad I couldn’t figure out a way to incorporate the word ‘evah’ into my blog title! Maine accents rule. I’m laughing so hard it’s difficult to formulate a response right now. But if I don’t reply now, I’ll probably forget I read this and then forget to reply (sieve for a brain these days). Loved the name Downeast Shores … etc. And your comment about sledding possibly putting you into traction is me to a T. I am woefully sad to admit that having had 2 very stiff glasses of mimosas on Christmas Eve day (poured by my much younger SIL) left me with quite the headache yesterday. Guess I can’t drink anymore either. Fortunately, my son loves to hug on my big squishy body, and for that I am eternally thankful. Thanks for the great laughs! And you are welcome for the laughs. Nothing makes me happier than when I read someone laughed at my ‘oldness’. I love your blog name. It is very memorable. I’ll take ‘memorable’, Louise. Happy holidays to you and your family as well. Hahahahaha!!!! I can’t even come up with words! Sometimes rambling posts are the BEST. There is something so freeing about just sitting down and letting the crazy thoughts fly, Kim. A glimpse into my inner voices….mua ha ha! I love your blog name because it immediately struck me that you were an ’80s gal after my own heart. My blog name looks like childhood relieved at a glance. Relieved reminds of antacid. I laughed through this post, particularly the new blog names. I always recognize you the minute I see She’s a Maineiac. But if you do ever try to change it go with Warm Fuzzies and Cold Beer. ,I like Adrindam, love it. Now why the heck did you go and put that last part in? Crap, I am going to have to throw away my oars now. My river of denial has officially sprung a permanent leak. Oh, no, don’t throw away those oars on my account! Just put on your slippers, wrap you bathrobe around you tightly and turn up the volume of the TV because you can’t hear Pat Sajak. It’ll all be just fine, I swear… floatin’ down that ol’ river of denial! I want this: Sh*t My Inner Voices Say. You know I deserve it. Hilarious, hilarious, hilarious, Darla. I heart your kids, too. And the PJs, slippers, rocking chair … all of that is me today. PJs all day, thank you. I also like your name. I think “She’s a Maniac” is most original. This is hysterical. I haven’t laughed so much since… heck I don’t know. A long time! Thank you man. Rosie, your comment really made my day. To know that you were bothering Mr. F and preventing him from reading a serious book is my goal when I write this blog. Fits of laughter are always a good thing. My kids keep me laughing all the time. Helps that they aren’t afraid to tell it like it is. It’s not the title that matters – it’s all the amazing, witty, hilarious, insightful stuff that follows that I come to read. You tell the best stories about your family and your role in it. And the confession about your almost ready for bed attire? How I can relate! I love it here! Thank you so much for the kind comments, SDS! Makes me feel better about the Flashdance thing, for sure. And I confess, that ready for bed PJ story wasn’t all true. It was closer to 6:30 pm not 7. I love your title as is, but all your alternatives are hilarious. And I would have loved, LOVED having your kids on Christmas morning – bet it was a ton of fun around your house with all the noise, merriment and fuzzy-slipper wearing. You should definitely arrange a play-date with GG’s kids – you and Paul would hit blogging gold with the combined cute comments of your kids! Oh–there was merriment to be had on Christmas day, Peg. So much merriment overload at around 5:30 am. But I make sure to enjoy every last crazy hectic second of it because I know how fast time flies. A play date with GG’s kids? Genius! Can it be in Bali? I love she’s a mainiac! reminds me of Chris Farley from Tommy Boy dancing in the water. Great post! Okay, now there’s a visual I will never get out of my head! My husband’s fave movie too. Hysterical! I have to admit, I also think of Flashdance every time. I’ve trained myself, however, to visualize the cool breakdancing from the movie, instead of welding or splashy water. 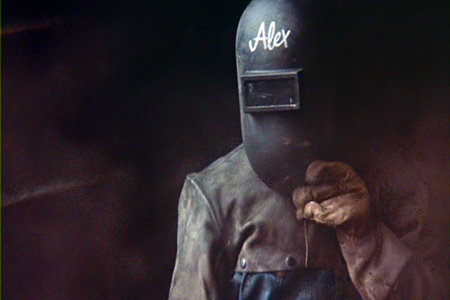 See, you’ve trained yourself to look past the Flashdance thing and I go and ruin it with one welder pic. –sorry! I LOVE your banner idea. Holy crapoli, that is good. The possibilities are endless. And y’know when my son said that to me, he had such an evil grin on his face. He knew he was getting under my skin with the ‘old age’ jokes, that clever clever boy! I love Not Fat. Not Pregnant Either!! haha! I’m voting for the Ironic Woman. You could even have a theme song that plays when you click on the blog. I’m going off into space a little here, but isn’t that the idea? Happy New Year to you! Oh, that is a fabulous idea! Now to think of a good theme song…hmm…Happy New Year to you as well! Also, I wish I’d paid closer attention when naming my Facebook page. I went to change it to include my actual name, only to get an error message that this can only be accomplished with very new pages. D’oh! Deb, all of my closets look like Toys R Us exploded in there. I have to admit, when I want to tidy up the house super fast, I just chuck everything in the closet and quickly close the door before the avalanche of junk can push it back open. I wanted to change my URL from ‘miraclemama’ to ‘she’samaineiac’ but then I am afraid I’d vanish from the internet and no one would ever be able to find my blog again! You may wish for another name, but I’m always glad when I see it pop up around the blogosphere. I know some fun reading will follow. Now that makes me feel warm and fuzzy! Thanks, Barb. Knowing you’ve managed to keep your sanity and sense of humor now that your kids are young adults gives me MUCH needed hope! Thanks so much, Melissa! I hope you and your family are enjoying this long vacation week? It’s only Wednesday and my kids are already bored outta their skulls. Doesn’t help that we have no snow anymore, so no sledding! D-Woww, I am DYING. You are freaking hysterical! And I don’t mean literally — or maybe I do, after reading your potential “sanity”-inspired blog title! The things your children said, and your reactions to them (“Oh, that’s nice.” “About a week ago.”) had me laughing out loud. You have the best attitude. Our Christmas break started off with the kids missing their last day of preschool because my son burst into my room at 4:30 am, woke me up with this loud, disgusting cough, and then vomited all over me. I’ll probably post about it — once I can bring my reactionary dry-heaves under control. Oh, that is the worst when your kids are sick, especially a stomach bug. Not a great way to spend the vacation, Melissa. I certainly hope the poor little guy feels better today. We’ve all been pretty illness-free this week (knock on wood) After my daughter’s pneumonia, I have had enough of this winter already. I think your name is hysterical and when I’m in a hurry SAM types out very easily. I think your name fits perfectly and would only be a problem if you moved…but then, it still wouldn’t be a problem because I bet your heart is in Maine. I love SAM. It’s perfect! And you’re right, even if I left Maine, I would always be a Maineiac. *Imitation. It’s all I can afford. Now that is a lot of ‘worth’! ha! I am still pretty jealous of the giant bag of PB cups you got for Christmas. And I am soooo happy you didn’t actually spit out any of your drink, such a waste! Yeah, but no PB trees? Nothing says lovin’ like the trees. I’m creeping around trying to dispel the Monday, Monday feeling that this Thursday has somehow acquired. Blah, blah, blah. Aren’t you thrilled I’m coming around to share the blah, kind of like the Cat in the Hat when he tried to clean the pink ring off the tub and just ended up spreading it to momma’s new dress, and the walls, and the whole, wintery world? Spread away, Peg! Or read my newest post about self-inflicted torture. It’s a great light-hearted read! I am still looking forward to finding those heart-shaped PB cups. You’d think they would already be on the shelves by now? Or maybe they were back in October and are already moving on to the Easter egg PB? Darla i passed an award “Candle Lighter Award” to your blog, to say thank you for all the laughter and to send you the best wishes for coming year. Thank you, Arindam. Same to you! I am happy this post spoke to you. And that my words somehow brought a laugh to you. I think you’re right about work. Sometimes, it can be a much-needed respite from the day-to-day craziness! I have about a thousand things to do today, and yet once I started reading this post, I didn’t want it to ever end. That’s a gift you have, you know. This has to be one of my all-time favorite comments. To know I caused you to procrastinate is my fondest wish. Thanks for that, it really made my day, Charles. Darla, I am always sad when it takes me so long to read your posts… I LOVED this one. It was perfect. I leave the tab open for days until I have time and finally I got to finish. I was stuck in the middle when a million other things happened. I would never be able to choose from all those hundreds of blog name ideas. It is better when there is a big story behind your name and when it takes a whole post to explain why you chose it and if you were or weren’t in your right mind when you did 🙂 Nice job! Hope the New Years went well. I had loads of fun writing this one. Coming up with all those blog names…some of them I seriously wish I had thought of before I went with She’s a Maineiac. Glad you enjoyed it! I had a wonderful New Years because I had no expectations, just went with the flow. I hope yours was good, too. I think you could make money selling blog titles. I struggled to come up with the “perfect” title, and you spewed out a bazillion in a matter of minutes! I am truly fond of your title. That would be a dream job, Patti. What’s funny is I had no problem spouting off these titles, but when I had to come up with my own, I drew a complete blank.